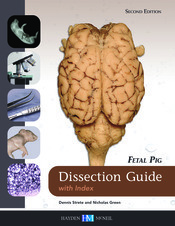 Fetal Pig Dissection Guide with Index is a pictorial guide, specifically designed for undergraduate students who plan to pursue a career in one of the health professions. It can also be adapted for both high school and undergraduate biology and anatomy classes for non-science majors. Students are given an introduction to the individual organ systems including a background on their organization, function and biological context. This guide comes with over 150 photographs and line drawings to help students understand and guide themselves through their own dissections. The text is broken up by organ system, each prefaced with an introduction to describe the organization, function, and biological context of each of the major organ systems. Tissues are also presented with their organ system so students can better understand the importance of histology to anatomy and physiology. The material primarily focuses on the fetal pig dissection process, but also includes detailed dissections of common lab specimens such as the sheep heart, kidney, brain, and eye. By providing clean, detailed, and clear photographs and illustrations to the dissection process, this guide breaks the steps down neatly so students can easily follow along. The clear and detailed nature of this title makes it a perfect addition to any classroom.